The passing of the nation-state bill last week by the Israeli Knesset has stirred a hornet’s nest of controversy and will further worsen the Israel-Palestine conflict. The law, which has quasi-constitutional status (Israel is yet to formally adopt a formal, written constitution; it instead has an unwritten constitution called the basic laws, which are periodically enacted) declares Israel to be a ‘homeland of the Jewish people’ and exclusively grants the ‘right to exercise national self-determination in the state of Israel’ to the Jewish people. The law declares that Jewish settlement is a national value and promises to encourage and advance settlement efforts. It also declares that Hebrew is the official language and Arabic will be downgraded to having ‘special status’. (Previously both Arabic and Hebrew enjoyed the status of ‘official language’ under Israeli law.) The law is largely symbolic and declaratory, but could have incendiary consequences later on. The law has generated bitter criticism in Israel and among the Jewish diaspora in America. The move to enact it has been condemned among the Israeli left, Israeli Arabs, civil rights activists and liberal Jews abroad. They regard the laws as discriminatory, racist and believe it enshrines inequality in law for non-Jews. The new law does not permit infringement of individual rights of Israeli Arabs. Civil equality, regardless of ethnicity, race and gender is enshrined in Israel’s basic laws and will continue unchanged. It could, however, tip the scales in favour of Jews in matters of housing, land settlement and state aid and will give the Jews as a community a more privileged status. As Avi Dichetr, the Israeli lawmaker who first proposed a version of the law in 2011 said to the Arabs, “The most you can do is to live among us as a national minority that enjoys equal individual rights, but not equality as a national minority”. The most immediate consequences of the law will probably lie in the thorny question of Jewish settlements, especially in the West Bank. Palestinians have frequently moved the Israeli courts for relief in cases of expropriation of land, illegal Israeli outposts or in property, water and road access disputes in the West Bank territories. The declaration could cause Israeli courts to weigh ever more heavily in a broad swathe of such cases. Already there are moves in the Israeli Knesset to pass a measure to restrict the right of Palestinians to move the Israeli higher courts. As a symbol, however, the new law will come as a body blow to the aspirations of Israeli Arabs and Palestinians. Collectively, they are reeling from multiple reverses on the political and diplomatic front. Israel’s warming ties with Arab states who give diplomatic, political and economic support to Palestinian movement will have an impact. Though far from being orphaned politically by the Arab states, the Palestinian Arabs will be wary of their brethren states and their declarations of support. Nor is Israel likely to offer even token gestures to an agonised, defeated people. 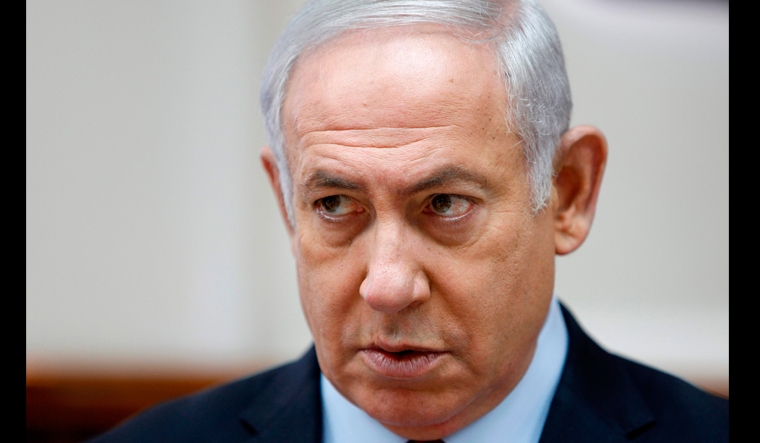 The right-wing in Israel is firmly entrenched in power and in no mood to make any concessions, even modest ones. The settler movement and the ultra-orthodox now cartelise state power, under the present political dispensation. There is no Israeli peace camp to speak off. Since the assassination of Prime Minister Yitzhak Rabin in 1995, no Israeli leader has been willing to expend political capital to achieve a lasting settlement of the problem. Any outreach to the Palestinian Arabs has come from civil rights organisations or some of the numerous NGO’s, who now constitute the peace movement in Israel. But they are politically minnows and can effect little change in the Israeli state’s attitude. Even if some miracle were to occur that would raise Palestinian hopes of greater normalcy, the Palestinian statehood has now definitely become geographically unviable. According to an American estimate, when totalled, the land occupied by Israeli settlements, illegal outposts and land off limits to Palestinians constitute about 60 per cent of the land of a future Palestinian state. Over 5,20,000 Israeli settlers now live in the 150 settlements and 100 outposts in the West Bank territories alongside 2.7 million Palestinians. To protect these settlers from Palestinian attacks, there is heavy Israeli security presence in the form of military bases, check posts, frequent patrols and an imposing security barrier. Palestinian population centres are now systematically cut off from one another. For a future state to be even viable, there must be at least geographically contiguous authority over which it may exercise jurisdiction. There are no parts of the West Bank where such a scenario might even possibly rise. The brutal geographical realities now no longer offer Palestinians even a deceptive mirage for consolation. Ghettoised in every sense of the word, it is anyone’s guess to what they will turn to for political salvation. The situation has now become febrile as the population numbers create their own political and security dynamic. Just under 13 million people live between the Jordan River and the Mediterranean sea. That is 6.34 million Jews and 6.56 million non-Jews. Non Jews, majority Muslim Arabs, Arab Christians, Druze and others now outnumber the chosen people in the Holy Land. Israeli Arabs are now 21 per cent of the total population of Israel, according to census figures. The demographic threat from the Arab minority has created real fears among Israeli politicians. The wider Arab world is plunged in civil war and ethnic and messianic bloodletting. If the political stalemate continues, then it may only be a matter of time before a defeated Arab population in the Holy Land turn to some diabolical new faith with ugly consequences for Israel.